New Cars: Eighth Generation Honda Accord 2008 is safe and reliable luxury sedan that flaunts the Honda snob value on its nose. Eighth Generation Honda Accord 2008 is safe and reliable luxury sedan that flaunts the Honda snob value on its nose. The latest Accord is a good-looking machine, after seventh generation model. Eager 2.4-litre i-VTEC engine is complemented by a choice of two gearbox options: a 5-speed manual and an automatic, with paddle shift. Handling is well balanced at most times. Ride quality is plush and keeps bumps at bay from entering the cabin. Average fuel efficiency should stand close to 9kmpl. 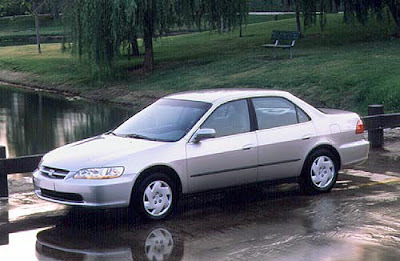 What you get here is a feature packed, safe and reliable luxury sedan that flaunts the Honda snob value on its nose. Soichiro Honda founded as leading automotive company in 1948 which is head-quartered in Tokyo, Japan. A leading auto company, Honda is the largest engine manufacturer in the world. Opening it's innings with Honda City in India, Honda met with instant success which was followed with the cab-forward design employed by the previous City and is continuing that success even now with the City ZX. Other offerings in the shape of the Civic, Accord and the CRV have also seen noteworthy sales figures. To cash in on the small car segment in India, Honda is working on offering a hatchback based on the Jazz, which should hit the Indian roads by 2009.